It's not difficult to spot the best Vanguard funds but how can an investor build a portfolio with them? You came to the right place for the answer! Perhaps the only difficult aspect of building a portfolio with Vanguard funds is narrowing down the options to a selection of a few funds that work best for your needs. There's so much to choose from! Vanguard may be the go-to place for investing in index funds, but they also have some of the best actively-managed funds money can buy. With such a broad selection of high-quality, low-cost mutual funds, there's no need to invest with other fund companies. Before we choose the best Vanguard funds to use for our portfolio, we'll review a simple but effective portfolio structure, called core and satellite, which is just as it sounds. The portfolio is built around a "core holding," such as a large-cap stock index mutual fund, which represents the largest portion of the portfolio, and other types of funds—the "satellite holdings"—each consisting of smaller portions of the portfolio to finish the whole. The satellites typically consist of funds from various categories, such as foreign stock, small-cap stock, bond funds, and sometimes sector funds. The primary objective of this portfolio design is to reduce risk through diversification (putting your eggs in different baskets) while outperforming (obtaining higher returns than) a standard benchmark for performance, such as the S&P 500 Index. This particular blend of Vanguard funds is an example of a moderate portfolio, which is appropriate for an investor with a moderately high-​risk tolerance and a time horizon of at least 5 years. Moderate investors are willing to accept periods of moderate market volatility (ups and downs in account value) in exchange for the possibility of receiving returns that outpace inflation by a significant margin. 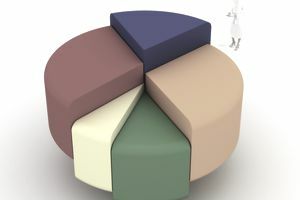 The asset allocation breakdown is 65% stocks and 35% bonds. You may have noticed that this model portfolio includes actively-managed Vanguard funds as well as index funds. But some investors understandably like the idea of investing only in Vanguard's index funds. This is because they have extremely low expense ratios and they track their respective benchmarks, which reduces the manager risk associated with actively-managed funds. This lazy portfolio is another moderate allocation, this one being 70% stocks and 30% bonds. No matter which Vanguard funds you choose, just be sure you are using a diverse mix of mutual fund categories and follow these guidelines on analyzing mutual funds.